It is a part of the mission of Brock University Students’ Union to support an atmosphere of inclusion on campus, and for students in general. BUSU strives to make all of our services and events accessible to all students. BUSU is committed to reviewing our policies, processes, and our built environment for barriers to access for persons with different abilities. BUSU has created an Accessibility Advisory Committee to assist us in identifying and eliminating barriers, and to ensure that there is continuous communication between BUSU and Brock University regarding accessibility issues on campus. The Committee is also intended to act as a forum for students to bring forward accessibility related issues, and will refer such issues to the appropriate parties involved. Please feel free to review BUSU’s Accessibility Advisory Committee Bylaw, or contact information for committee members. In accordance with the Ontarians with Disabilities Act, BUSU recently created an Accessible Customer Service plan, which can now be downloaded here. For more information about accessibility on campus, and the University’s accessibility policies please visit Brock’s Accessibility Planning Webpage. Brock University Students’ Union is committed to maintaining environmentally friendly practices. BUSU makes every effort to ensure that our services and events are run in a manner that reduces our environmental impact. BUSU collects a “Green Levy” of $1.00 per credit from all undergraduate students for the purpose of improving our environmental efficiency and reducing our impact. Funds collected from the Green Levy can be used in a number of ways to improve BUSU’s operations, including renovations to BUSU’s facilities that increase energy efficiency, eliminate waste, and decrease BUSU’s environmental impact. It can also be used towards the incremental cost of increasing the sustainability of BUSU events, activities and operations, as compared to the base cost of standard practice. Money from the Green Levy may also be used to fund groups, events, activities, student research projects and other initiatives which have an explicit environmental purpose. 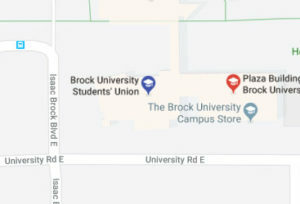 Funds for these purposes must gain approval from the BUSU Board of Directors, as well as from Brock University Students’ Administrative Council (BUSAC). If you have a student group, event, or activity that is environmentally focused, and you would like to request funding from the Green Levy, please contact Kayleigh Rossetto. You can read the Memorandum of Understanding outlining the specifications for spending Green Levy funds here. New this year! BUSU’s Green Levy recently covered the purchase of a Green Reads used book vending machine. Students can purchase a used book for $2 with all proceeds going to the Student Justice Center Food Bank. The machine also accepts used book donations. Come and visit the machine located outside of the BUSU office!